PGA professional Jamie Fraser’s knowledge of putting has no borders after completing the CPI Course from different countries this summer. Fraser, who has been a PGA professional for 6 years started the CPI Course online while at The Clubs at Houston Oaks in Houston, Texas and completed it upon his return to Scotland, taking advantage of the online aspect of the course. “I enjoyed the CPI layout which was easy to go through, as well as being able to do the course at my own speed. As there are no deadlines I could do it in my free time. I actually started the course in Houston and completed it in Scotland,” said Fraser. 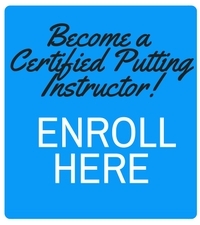 The Certified Putting Instructor (CPI) Course is a certification offered by U.S. based Frankly Golf in co-operation with the PGA with the goal of helping golfers putt better, adding an extra dimension to the services that the golf professional can deliver to their membership. Fraser, who is a graduate of The University of the Highlands and Islands Golf Management degree programme and completed his PGA training at The Renaissance Club in North Berwick, Scotland looks forward to applying his new found knowledge. “I want to improve my teaching and that is why I did the CPI Course. I am keen on teaching and would like to do more of it and get more knowledge in the long term. 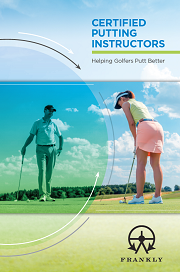 “The CPI course gave me more confidence in teaching putting. Obviously I have known bits and pieces about putting but never had a structure to follow for lessons until now,” said Fraser. He also learned some new aspects of putting from the CPI Course. “The CPI Course taught me a few new things, like the degrees of freedom. “You know when you see a good putting stroke but you are not quite sure why it looks like that. The fact that the putting stroke is broken down in the CPI Course helps you look out for certain things. It is very clear what you need to do and the CPI Course also gives you the background knowledge to help you explain to your student why it needs to be done in a certain way,” said Fraser. Fraser, looks forward to helping golfers putt better both in Scotland and the USA as he furthers his career internationally. “I think that putting is underpractised by golfers. It seems to be more glamorous hitting balls, but most of them need help with their putting and being a CPI I look forward to providing that help,” said Fraser. “Well done to Jamie who completed the CPI course without being restricted by international boundaries. We are pleased to see how he has taken advantage of the online aspect of the CPI course by accessing it from different countries. He clearly recognizes the benefits of approaching the teaching of putting in a systematic and structured way which makes teaching putting so much more effective” said Frank Thomas co-founder of Frankly Golf, former technical director of the USGA, inventor of the graphite shaft, and the person who introduced his redesign of the Stimpmeter to the world of golf.